Tom DeLattre was born in Yorktown, New York, and was raised in Syracuse, New York. 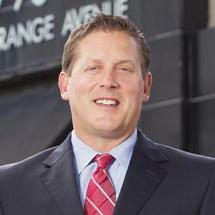 He joined the firm in 1994 and is currently a partner in Wieland & DeLattre, P.A. Mr. DeLattre devotes the majority of his practice to pursuing justice for clients injured from trucking collisions, motor vehicle collisions and motorcycle collisions. Mr. DeLattre also has significant experience litigating cases involving injuries as a result of negligent road construction design, premise liability, defective products and work-related accidents. He belongs to the Million Dollar Advocates Forum, devoted only to trial lawyers who have achieved a settlement or verdict of a million dollars or more. In addition, he is AV Preeminent* peer-review rated, the highest rating, through Martindale-Hubbell, a world-renowned attorney rating service. Not only is Mr. DeLattre a member of the Florida Bar Association, he is admitted to practice in the U.S. District Court for the Middle District of Florida and is a member of the Orange County Bar Association, Florida Justice Association (formerly Academy of Florida Trial Lawyers), American Association of Justice (formerly Association of Trial Lawyers of America) and Florida Workers’ Advocates. Tom attended Barry University School of Law where he obtained his law degree in 2001. Prior to attending Barry University, he obtained his Bachelor of Science from Oneonta State University, where he also played NCAA Division III basketball. Feel free to contact Tom as he is always available to assist.